The first Tom Ford Soleil cushion foundation provides the healthy-looking glow and natural sheer coverage suitable on all skin types for the ultimate Soleil state-of-mind. The lightweight formula evens out skin tone, minimizes imperfections and brightens the complexion with a dewy glow. With SPF45 protection and a refreshing cooling sensation, it's Soleil perfection in both flesh tone shades for a radiant, smooth natrual look and tone up shades for instant glow. 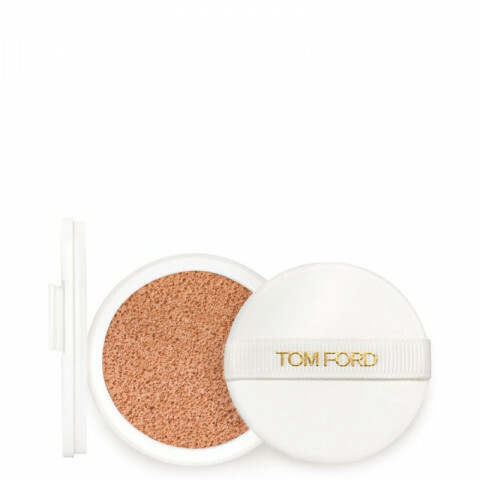 Enriched with the Tom Ford Infusing Complex and pearl powders, skin is well-hydrated with radiant comfort. How to use: Apply foundation with the cushion onto the entire face. Build for desired coverage. For a hydrating glow, apply tone up shade as primer, to even complexion, color-correct and give luminosity to skin, while prolonging foundation wear. Tone up shades can also be used on top of foundation, as a highlighter.